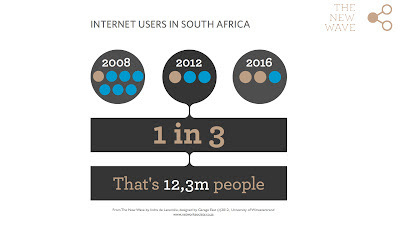 Who uses the Internet in South Africa, where they use it and what they use it for. We launched our South African Internet report this evening at Wits Art Museum in Braamfontein. @ambio - Steve Ambrose - of StrategyWorx tweeted "Amazingly comprehensive study with suprising results." (c) 2012, University of Witwatersrand. We've gone from 15% of adults using the Internet (1 in 7) in 2008 to 34% in 2012 (1in 3). As the financial ads say, past performance is not an indication of future performance, but if this rate of growth was maintained, more than 50% would be online by 2014 and 66% by 2014. What factors will slow this growth? Price is an important factor. But not the only one and possibly not even the most important one in maintaining growth. 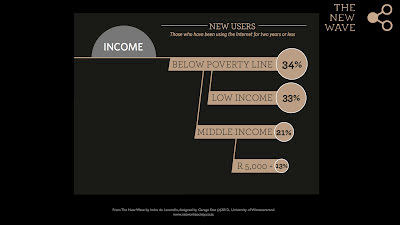 Our research shows that many new users (those with 2 years or less online) are on low incomes. A third of them are living on less than R432 per month, the poverty line used in the National Development Plan. Another third are living on less than R1,500 per month. (c) 2012, University of Wiwatersrand. Many of these users are using expensive mobile data. But many of them are also using shared connections, some paid for and some free: Internet Cafes, Schools, Colleges and libraries. So increases in availability of shared facilities - especially free ones - may be just as important as reductions in data costs in explaining the increases in usage we have seen. This month, for example, Mpumalanga announced that they had almost completed their goal of making free Internet available at every one of their public libraries. Mobile and shared facilities have different limitations. One lesson I have drawn from our research though is that the increased availability of Internet capable mobile phones is not the only reason that usage has increased. Shared facilities are an important part of what has enabled many South African on low incomes to gain access to the Internet. So to see whether growth rates are going to be maintained we may need to look at issues like whether other provinces are managing to their libraries as quickly as Mpumulanga's, at whether Western Cape's successes in connecting schools is being replicated elsewhere. The report and info graphics were published this evening at www.networksociety.co.za. Check them out. See http://www.networksociety.co.za/Media+Resources for credits and conditions for reproducing the report and infographics.